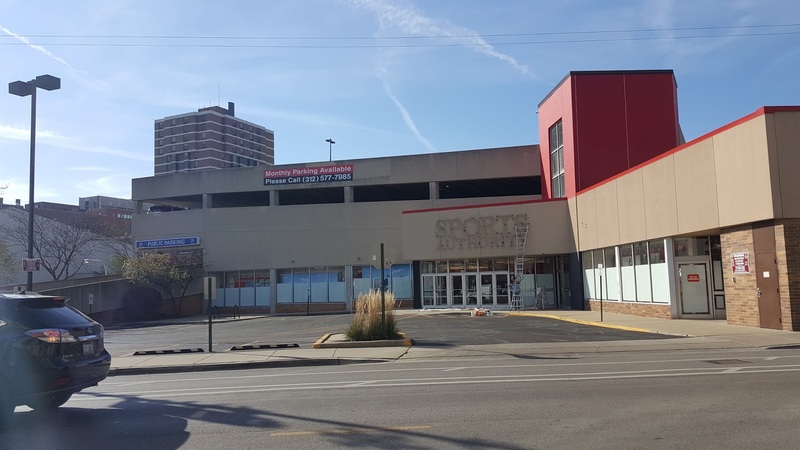 The former Sports Authority store at 3134 N Clark Street in Lake View is still vacant. The property is marketed for lease as Clark / Barry Commons. We noticed a couple workers with a ladder last week working on the old sign. Bob's Furniture is taking over the Fullerton Avenue store. This location is across from Point at Clark featuring several chain retailers DSW, Marshalls and Michael's. Briar Street Theater , Binny's and dozens of restaurants/bars/shops are near the parcel. One can expect another large chain retailer. The area (and Chicago's North Side in general) has seen so much large commercial redevelopment that it is hard to believe this site would not be redeveloped into two story retail space for a new store.